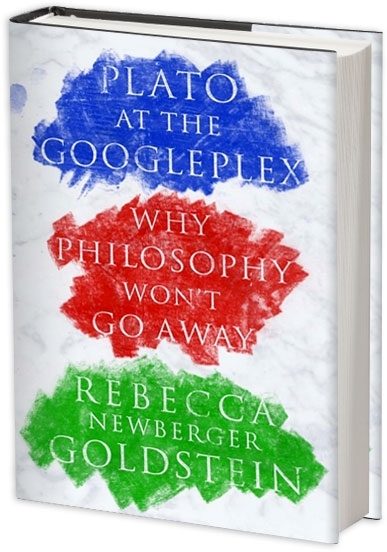 “Just accept the one preposterous premise that Plato could turn up in twenty-first-century America, an author on a book tour, and everything else, I hope, makes sense.” That’s the preposterous but brilliant premise of Rebecca Newberger Goldstein‘s latest book, Plato at the Googleplex: Why Philosophy Won’t Go Away, a witty and stimulating tour of Ancient Greece interspersed with “out of time” Platonic dialogues with a right-wing talk-show host, an agony aunt, the 92nd Street Y, and staff at the Google campus in Mountain View, California. Remember that bit in Bill and Ted’s Excellent Adventure when Socrates, Beethoven, Joan of Arc et al go wild in a shopping mall? It’s sort of like that, only with a much more rigorous approach to textuality. It’s also a fierce defence of the practice of philosophy today, at a time when many scientists and other “philosophy-jeerers” would have you believe that philosophy is just a stop-gap, a method of generating questions that will later be answered by science, and has no inherent value in itself. Goldstein intersperses these witty imaginings with historical context for the thinking that her Plato puts forward. Each of the contemporary dialogues is preceded by a chapter that delves into the history and thinking of Ancient Greece, and in particular the city-state of Athens, from whence hailed Plato and his hero, Socrates. Perhaps the most important concept to grasp is that of arete, most commonly translated as “virtue” but rather more nuanced to Plato’s contemporaries. In Ancient Greece it denoted excellence and worthwhileness, but also notability — as Goldstein points out, it was perhaps closer to our “distinguished”. Being distinguished was a big deal for the Greeks, who, despite living in a theistic society, were very much concerned with the earthly trappings of the worthwhile life. Achilles was the ultimate hero to many Greeks because he forsook a long life in favor of a short one characterized by courage and violence, thus ensuring the extension of his earthly life by his kleos, or “acoustic renown”. This was “the Ethos of the Extraordinary”. The positioning of the personal drama — being accused, convicted, imprisoned, and executed — as a mere backdrop to discussions of timeless questions is meant itself to convey a moral lesson. To reflect on the conditions that make a life worth living is to remove oneself for the circumstances of that life as much as possible. It is to see that life in the context of a perspective that does not take the contingencies of that particular life that you happen to be living overly seriously. To philosophize is to prepare to die. Or, to truly take your life with the seriousness that philosophy demands, you can’t take your life all that seriously. This is to give a new philosophical spin, more dizzyingly paradoxical, to the old Greek idea that the hero is, like Achilles, prepared to shorten his life in order for that life to be something extraordinary, arete achieved. The life worth living continues to haunt us today, of course. Despite two and a half millennia during which the Judeo-Christian approach pointed many people elsewhere in their search for answers, the question of how to live is still vital to many people. Think of the piles of self-help books published each year, or the flourishing of Alain de Botton’s School of Life in London, or even just the fierceness of contemporary debate over social issues. It’s into this world that Goldstein pitches her reanimated Plato. And so to the book tour. The Googleplex is just one of the places Goldstein sends Plato, but it’s the first, and it equips him for his whole adventure. He quickly becomes inseparable from his laptop, and his access to the world’s information is excellent preparation for his subsequent meetings. The inner workings of Google become a measure of how far we’ve come versus how much further there is to go — or why we still need Platonic questioning. Goldstein’s Plato echoes many contemporary concerns over online surveillance: “If we don’t understand our tools, then there is a danger that we will become the tool of our tools.” He makes a useful distinction between the collection of information and the collection of knowledge. And he’s sceptical of the hive mind’s ability to answer ethical questions, to produce tangible knowledge. After all, how could an algorithm be programmed without inbuilt ethical assumptions? “Knowing” what we “know” may yet be insufficient for answering the biggest questions. what hope could there be for arriving at some consensus about the most important questions a person could ask himself, what hope for blasting through the biases that make each person see the world at a severe slant depending on his own individual positioning, if we don’t bring lots of slants into the dialogue, so that, colliding with each other, something straighter can emerge? 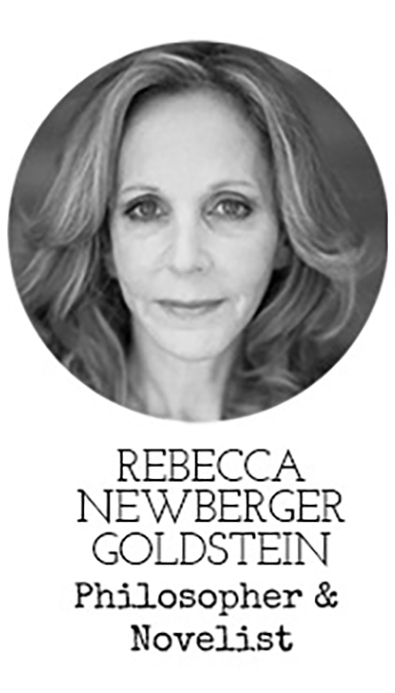 Rebecca Newberger Goldstein will appear at our next Seriously Entertaining show, Summertime Blues, on June 15 at City Winery NYC. Buy tickets here.